This gift is the perfect way to celebrate any occasion by saying "Cheers!" Make their moment special by sending this sweet gift box that is worth celebrating for! 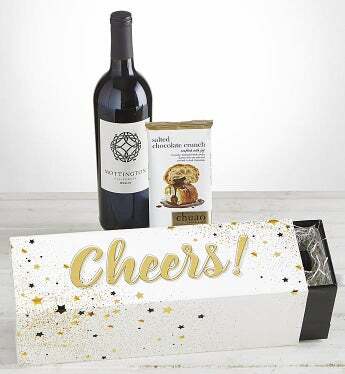 This fun keepsake slider box is filled with Mottington Merlot Wine and paired with a Chuao® chocolate bar. This gift will surely put that special someone in the mood to celebrate! This Merlot possesses a very inviting, dark garnet color in the glass. Aromas of holiday-spiced plums, ripe cherries and dried cranberries immediately greet the senses followed by exotic notes of blood orange and cocoa powder. While this wine is big it is also balanced. The oak in this Merlot delightfully frames the complex ripe coastal fruit aromas of this wine. It is a spicy, ripe styled California Merlot with flavors big and bold enough to pair with the heartiest meats.